Born 1470 by concubine Ji, Zhu Youtang with reign title Hongzhi was at first hidden for almost six years to avoid being murdered by the emperor's jealous concubine Wan. In 1475 his father, the Chenghua Emperor, was told of his son's existence and he happily accepted him into the court and made him Heir Apparent. 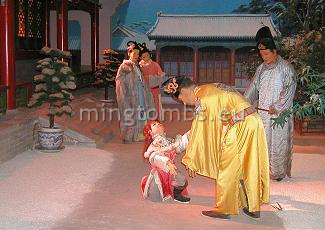 Zhu Youtang's mother was less fortunate as she was promptly murdered by concubine Wan's agents. He mourned the loss of his mother but in vain sent several delegations to Guangxi in search of her family. Aged 17 on accession on 17 September 1487, Zhu Youtang, the Hongzhi Emperor and 9th emperor of the Ming Dynasty, soon proved a capable and just ruler. He banished corrupt eunuchs and used talented officials. He understood well the need of his people, he reduced taxes and promoted trade and industry. The Chinese empire prospered and the period became known as "Hongzhi Resurgence". He lived a frugal life in line with his strict Confucian upbringing and is the only Ming emperor who only had one wife, empress Zhang. He is also the only Ming emperor who never took a concubine. Zhu Youtang died in Qianqing Palace in the Forbidden City in 1505, just 36 years old. 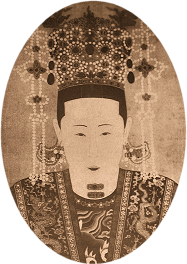 Empress Zhang died in 1541. They left three sons and two daughters. His eldest son Zhu Houzhao succeeded him as the Zhengde Emperor. The tomb follows the traditional layout of a ceremonial area in front of the actual burial area. The entrance hall is long gone but its platform remains intact. The stone bases of the pillars are also extant. In the ceremonial yard a rebuilt silk burning oven is the only complete structure. The platform and pillar bases of the main hall also remain but only lower wall sections of the hall itself stand. The stone sacrificial vessels in the tomb area remain as do the pillars of the Double Pillar Gate. The Soul Tower has been partially restored. 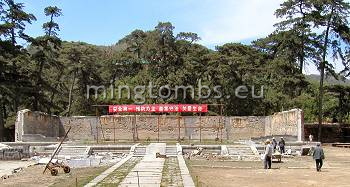 The Hongzhi Emperor was interred in the northernmost tomb of the entire Ming imperial cemetery. Empress Zhang was buried beside him upon her death in 1541 following which the tomb was sealed. The name of the tomb is Tailing. Empress Zhang, a native of present-day Hejian, Hebei Province, became a princess in 1487. She became empress when the Hongzhi Emperor ascended the throne. Tailing is located at the southeastern slopes of Mt. Bijia ("Pen Rack Hill"). Construction started in June 1505 -just after Zhu Houzhao's death. Many of the above ground structures have long since collapsed. A major restoration is taking place at the time of writing this in July 2006 and the entire site is off limits to all but the workmen. The photo above right shows the sacred way right inside of where the original gate stood. The large structure in the centre is the remains of the original main sacrificial hall, Ling'endian. The hall is five bays wide and two deep. Three individual stairs lead up to its platform, each flight of stairs some three meters wide. The center flight of stairs is decorated with the traditional Danbi stone block. The photo above left shows the only main structure left relatively intact; the memorial stele erected on top of the traditional turtle figure. The stele carries no inscription. The square structure around the stele is gone. But this stele was only erected in 1536, many years after the completion of the tomb. 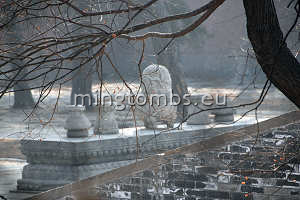 Until that time only Changling of the seven Ming tombs that had already been built had a "Divine Merit Stele". It was actually the Zhengde Emperor's adopted son, Zhu Houcong -also known as 11th Ming Jiajang Emperor- who had the stele erected at Tailing as a tribute to his father. But Zhu Houcong was so busy seeking the elixir of life that he soon lost interest in the stele or in writing an inscription, for that matter. Funnily, the subsequent Ming emperors followed suit and also left their respective Divine Merit Steles without inscriptions. Overgrown with weeds and grass, the roof of the Soul Tower was in danger of collapse until a July 2006 restoration produced a new roof. All that remains of the Double-Pillar Gate are the two upright columns, but the five sacrificial stone vessels have been partly restored. All of the surrounding perimeter walls have been rebuilt. The entrance, Ling'enmen, or "Gate of Enormous Favor", was four rooms wide and one room deep and is no longer extant. A full-width flight of stairs led up platform on which the entrance hall was built. The eastern silk burning oven has been restored. 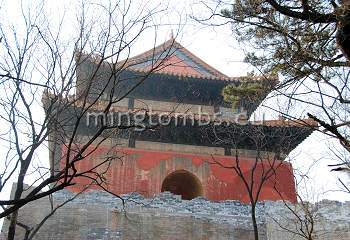 It was however rebuilt with vermillion walls and a grey tiled roof -very different from the yellow-glazed tiles and roof tiles of imperial Ming dynasty tomb sites. 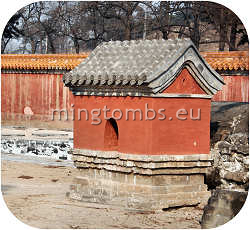 It is the only surviving original ceremonial oven in the Ming tombs. The platforms of the eastern- and western side halls are extant, but uniquely placed alongside Ling'endian. Normally, these would be placed in front of- and south of Ling'endian. Ling'endian, or "Hall of Enormous Favor", was a Ming standard 5x3 bay construction. It is mostly dilapidated with only remnants of the side and back walls extant. The front, which was mainly built from vermillion colored wood, was burnt down long time ago along with the wooden beams in the rest of the structure. The tomb has not been disturbed by grave robbers and remains unopened.